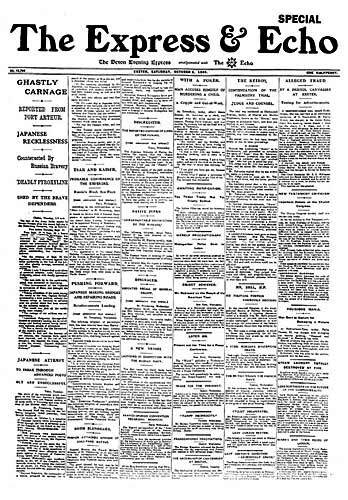 On 1st October 1904, the Express and Echo published its first daily edition from 225/226 High Street. 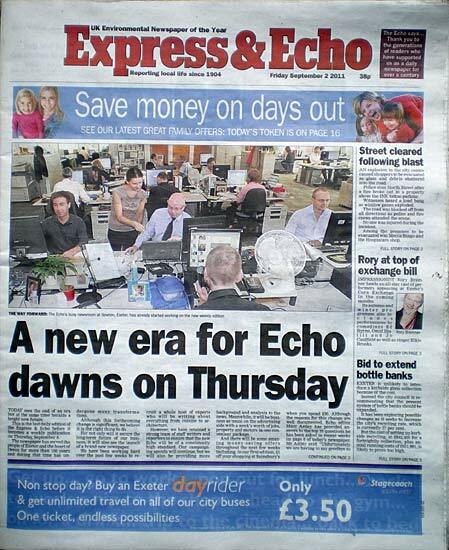 After almost 107 years, on Friday 2nd September 2011, the last daily Echo was published. It has been replaced by a weekly edition from Thursday 8th September 2011. Many will mourn the loss of a daily Exeter newspaper, but digital technology has forced a new approach. Two hundred pages – lets hope that local news lives on in the weekly edition. Goodbye to the old, and welcome to the new. 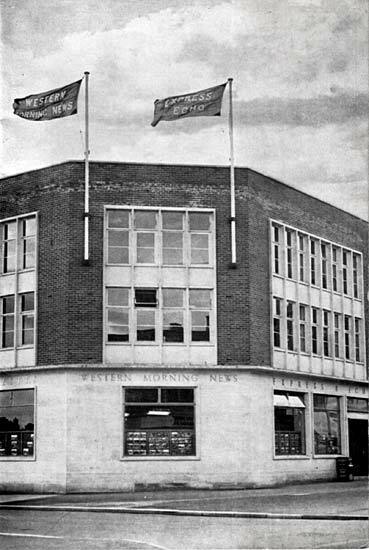 Apart from a few days after the blitz, when it was printed in Torquay, the Echo was printed and published between 1904 and 1958, at 225/226 High Street. 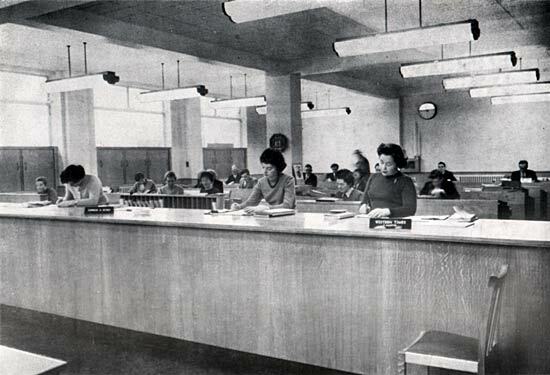 In 1958, the offices and printing works moved to Sidwell House, 160 Sidwell Street. 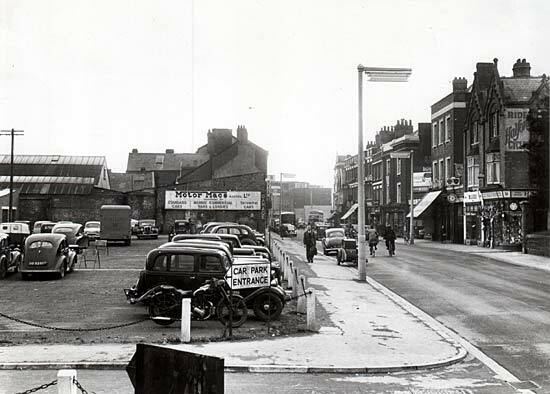 The photo left, shows the empty site before Sidwell House, right, was constructed. 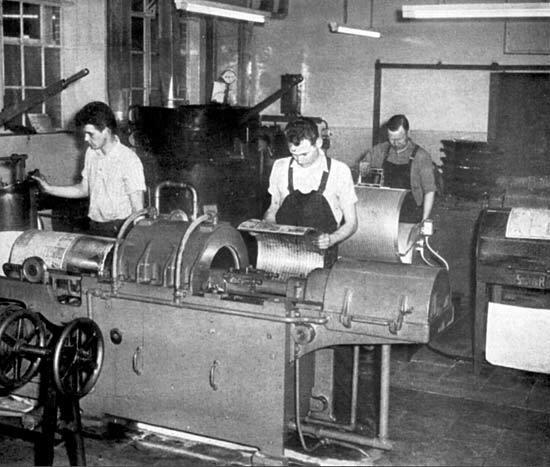 The new works was modern and well suited for newspaper publishing in the 1950s. The general office and reception was where the public could drop in their small ads. The first use of the telegraph to send a news report was in 1858. The transmission of photos commenced in the 1920s. 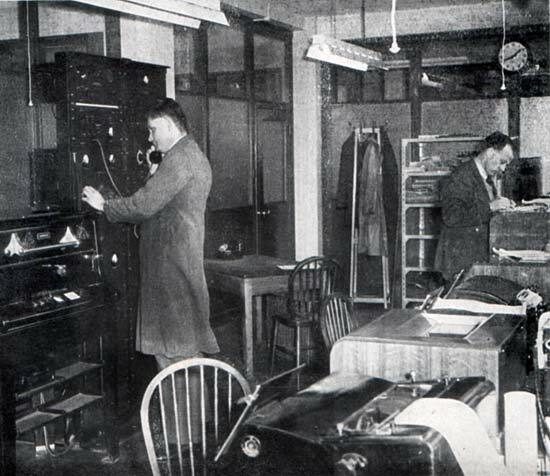 The wireroom was the hub for incoming news reports. Six teleprinter receivers could take the latest news from the Press Association. 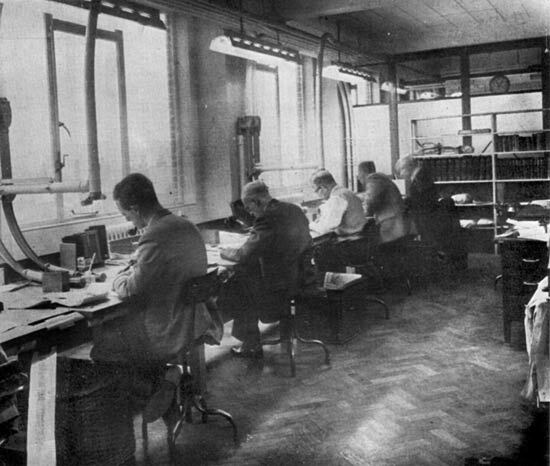 Each item was transferred by Lamson (pneumatic) Tube to the News Editor and Sub-Editors. A Muirhead wired-picture machine could receive pictures over the telephone lines – similar to the fax machine, the technology is now redundant. A sub-editor's job is to check the format, accuracy and style of the text. They will ensure each article from the reporters and editor is checked for errors, both before it is type set, and after. A modern sub-editor will use desktop publishing software, and be responsible for the design and layout, a job formally done by design and production specialists. 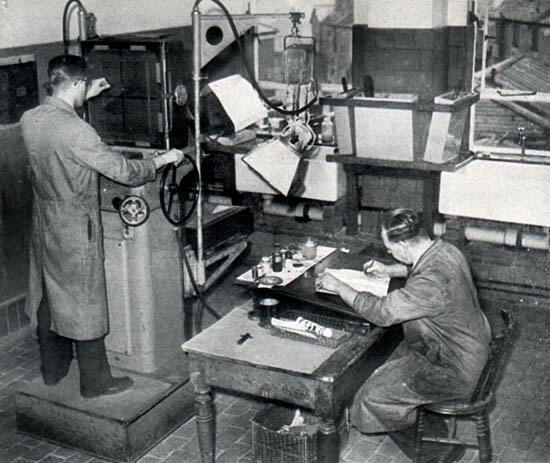 The process camera was used to photograph graphic material through a screen – the half-tone negatives were used to burn on to a copper or zinc plate the dark parts of the image. Acid was used to burn away the exposed metal, leaving the raised dots of the image. This work is now done on computers. 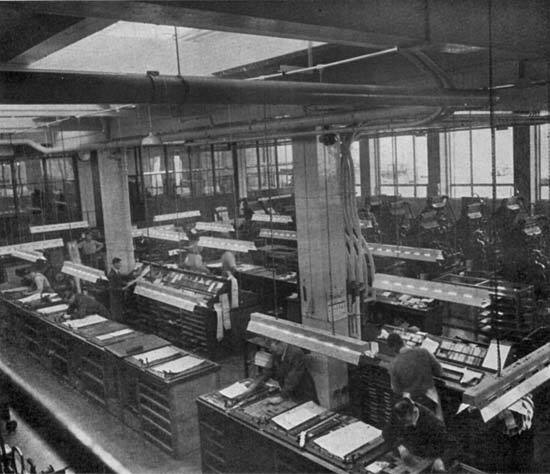 The typesetting was done on linotype machines. Operators would type in a line of type, to produce a hot metal slug. The slugs were assembled onto flat metal surfaces called make-up 'stones', the whole held together by leavers that applied pressure. A paper-mache cast was made of the page using pressure – the auto-plate machine was used to cast a semi-circular metal 'stereo-plate' that were attached to the cylinders of the rotary press. The printing plates are transferred to he printing machine. 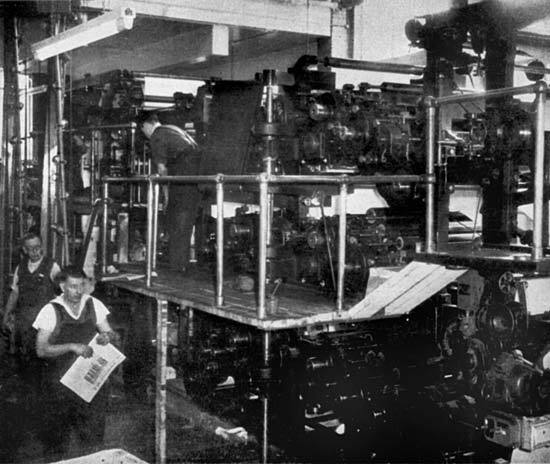 Newsprint (the paper) is then threaded through the press between the inked printing plates and impression cylinders. 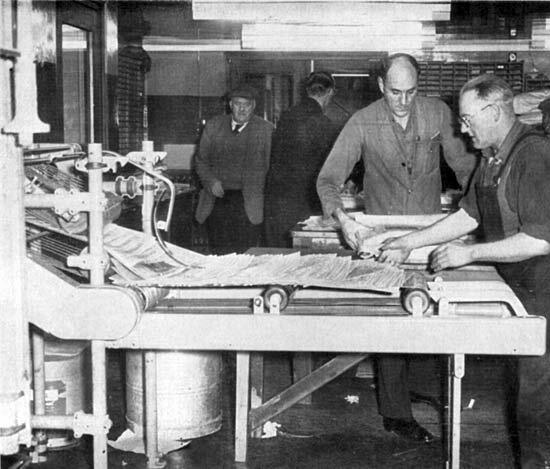 The printed paper emerges from the machine for cutting and folding. The machine could produce 20,000 to 30,000 newspapers per hour. The newspapers come off the igranic conveyors where vans were waiting to take bundles of papers for delivery. The modern Express and Echo is printed near London and driven down overnight by van.